The Rock Dog (犬岩) is one of the historic sites of Far Eastern Chiba, Prefecture. 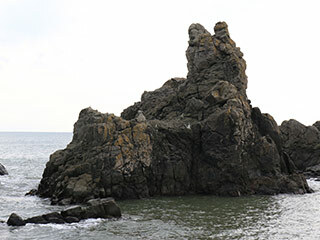 It is a huge rock on the sea that looks like a dog. Legend said the dog of Yoshitune was left over here when he escaped to the north. He was barking for 7 days and 7 nights for his master. The name of Inubo, means dog barking, was comes from this story. 1. use JR Sobu Line to Choshi Station. 2. use Choshi Denki Line to Sotokawa Station. There are many legends in Choshi about the tragic hero Minamoto Yoshitsune When pressured by Minamoto Yoritomo, Yoshitsune escaped to Oshu in the north. Yoshitsune left his pet dog on the beach of Choshi. His dog, longing for his master, cried for seven days and nights and Turned to a rock. That rock is now called Inuiwa, or "Dog Rock." The name Inubo in cape Inubosaki comes from the sound of the barking dog which reached the cape. The name Senkigaiwa, was named after the thousand soldiers, together with Yoshitsune who confined themselves in the rock cave. Houman in Nagasaki shore is said to have its origins in Kurohogan Yoshitsune, which gradually changed with time in the local dialect. The islands resemble a man lying on his back gazing at the heavens.